A difficult day doesn’t mean we haven’t made progress. On April 13th, the Sun in Aries will square Pluto in Capricorn, creating a point of transformation that we must undergo in order to get to the clarity that awaits us on the other side. But what does the Sun square Pluto mean for our zodiac signs and love horoscopes? First, we need to understand the nature of this transit. In astrology, a square is when two planets are within 90 degrees of one another and create a stressful or sometimes difficult aspect. While it’s uncomfortable, it always results in growth. 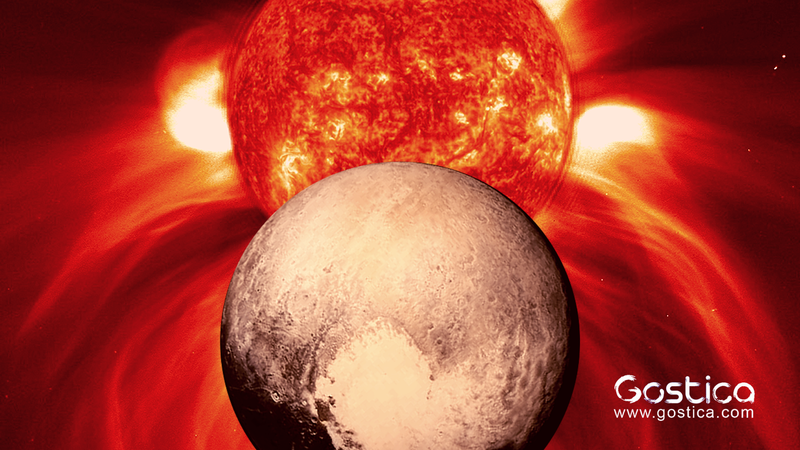 The Sun represents our inner self, and Pluto is all that which is below the surface. This means we will have to deal with someone we likely have buried quite deep within our psyche, and will have to face it head-on to go into the coming Pluto retrograde, ripe for the lessons he’s meant to bring. Because we won’t see another Sun-Pluto square until October, we’re likely to feel these transformational energies for the next six months until the Fall when we start seeing the results of all the work we’re doing. We have a fresh start. We are beginning a new chapter with our Sun in Aries and our brand new Uranus cycle that we began last month. Nothing is as it was before, but sometimes we forget how far we’ve come. It’s easy to let a moment make it seem like we hadn’t come as far as we hoped. Yet, even this process is a necessary one. In Aries, we’re feeling more driven and more ambitious, which sometimes translates to us sweeping things under the rug that we just don’t feel like dealing with. It’s a time when we’re less likely to sit around worrying if we’ve made a mistake, and instead just keep moving forward. That is, unless the Sun is meeting up with Pluto. Pluto is the lord of the underworld and governs all the bits of life that are hidden from plain view. The guardian of secrets, physical intimacy, power, death and themes of rebirth or renewal, Pluto acts harshly at times but always justly. Pluto and Uranus are often seen in a similar light because both outer planets tend to have a dramatic and swift way of changing even the most stables parts of our lives. While these realizations or moments tend to feel very unstable, they always lead us towards the path we’re meant to travel. Astrology is all building blocks; what occurred last Fall was being built upon by our eclipses, Mercury retrograde and supermoons this year. And this is just one more moment towards that inner work we are meant to do so we can bring our lives in greater alignment with our truth. For many of us, we’ve been in a state of flux since last Fall. We knew there was no going back to where we were, but we weren’t quite sure where we should go. It seemed that all areas of our lives were up for renewal, including our physical home, career, and especially our love life. We like to disregard the importance of our love lives, thinking it’s just a way to avoid loneliness. However, regardless of what choices we end up making, nothing helps shapes our lives than the relationships that don’t work out. And within the timeline of our partners, we can see examples of our own growth we’ve experienced. This is a time of leveling up. Pluto will turn retrograde on the 24th of this month in Capricorn for the next five months, which will be ushering in a new way of being. In many ways, it’s these next few months that are going to build the bridge from the life we thought we’d live, towards the life that is now taking shape before our eyes. But this means we can’t run. We can’t avoid what needs to be dealt with, and we can’t blame our current partner for the pain and chaos we experienced with our ex. Part of moving is forgiving — not just the person or even the situation, but also yourself. It’s about knowing we had to go through everything but that we’re different now and we don’t need to keep repeating the same lessons only to stay stuck in patter that no longer fits. And this brings us to this moment where we know we are different, where we know that we’ve grown, but there’s still something we haven’t dealt with. It’s something that’s buried below the surface, and if it’s not healed, it could end up reemerging, sabotaging anything new we thought we were building. The Sun square Pluto knows we want to rush ahead, that we have grown and changed, but wants us to step on the brakes just a bit before we realize we ended up somewhere we wished we hadn’t. It’s important to look at our patterns — from childhood, friendships, and especially romantic relationships. Who do we attract? How do we react to conflict? Do we find ourselves giving into the needs of others? Do we not compromise enough? Do we keep dating the same unavailable guy? Are we really ready to open ourselves up to love? These are just some of the questions that are crucial to consider. We can move on, but in order to really make new patterns, we also need to start making new choices. It’s easier to not think we’re the problem, that we’re the reason relationships haven’t worked out, or that life hasn’t gone according to plan. But within those moments, we also give our power away. We make life what it is, and each day we have the choice to sweep yesterday under the rug, only to be revealed tomorrow or to actually stop, heal what hurt us, take responsibility for the hurt we caused, and know that we are on a new path. This was written by Kate Rose For YourTango. Kate Rose is an artist, writer, passionate yogi, spiritual astrologist, relationship and life coach.